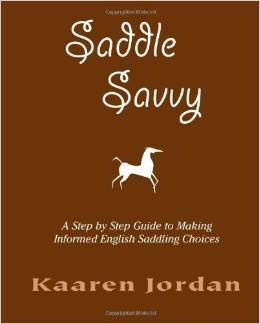 SADDLE SAVVY….a step by step guide to making informed english saddle choices. My goal in writing Saddle Savvy for English saddles is to provide horse keepers with tools that enable them to understand how to select saddles that fit both themselves & their equine friend, to assess suitability of current saddles & to trouble shoot existing situations. By applying the information presented in this e-book or paperback book, you will be able to ask saddle sales people & fitters key questions to make sure you select what is appropriate for your & your horse. Since the saddle market has expanded beyond traditional treed choices over the past 10 years, I have included a chapter on understanding the Alternative options available. This section is devoted to assisting you to navigate the myriad of brands to select the type that best suits your needs & your horses back type. Special headings cover padding system selection for the different back types & trouble shooting existing issues. As the saying goes….”knowledge is power”. My intention is to share information that will give you the power to make informed choices for both you & your horse. “SADDLE SAVVY” is available now for just $12.95. After clicking the “Buy Now” button you will then be taken directly to the secure PayPal site where you can either pay with a credit card or from your PayPal account. The whole transaction takes place in the PayPal system which keeps your identity and account information secure and secret. Our account, which you will see appear automatically on the PayPal webpages, is info@kaarenjordan.com. Once you are finished it is also a good idea to confirm the receipt of your payment to insure you receive your e-book copy quickly. Please email us at info@kaarenjordan.com and we’ll respond as soon as possible. And of course, thank you for your order! Once your secure payment is recieved via paypal, we will send you your book along with a personal thank you from Kaaren! You can expect to receive the ebook attached to an email within 48 hours, although it usually arrives sooner as we tend to send it out within a few hours of receipt of payment. If you do not receive the email with the attached ebook within this time period please check your spam filter. If you do not find it in the spam filter then email us and let us know that you have not received the ebook, and if you have an alternate email address give us that too. The email system is not perfect and sometimes it takes more than one attempt to get the ebook through. Not to worry though as in the 10 years we have been selling the ebook online we have always gotten a book through to everyone who has ordered it. When you receive the email look for it as an attachment titled SaddleSavvy.pdf. If you click on the file you should see options to save and or open it. We suggest that you save the file to your hard drive first and then open it. It is a PDF file and can be read by a number of programs. Most computers come with programs already installed that will read PDF files. If your computer does not have a program that will do this then you can click on this link and download a free copy of the Adobe PDF Reader. Book also available in paperback through Amazon.